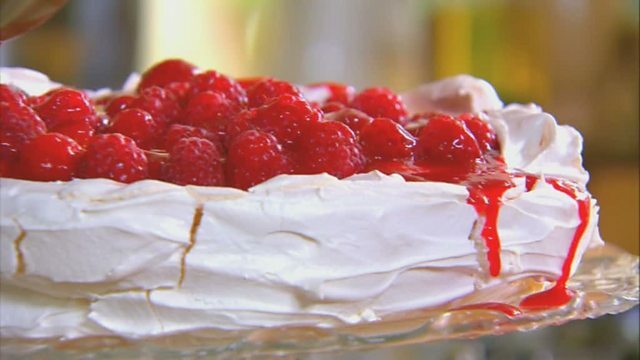 This delicious pavlova, laden with whipped cream and red fruits, will put paid to anyone’s diet. Draw a 23cm/9in circle on a sheet of baking paper using a pencil. In a large bowl, whisk the egg whites until stiff peaks are formed when the whisk is removed. Whisk in the sugar, a tablespoon at a time, until the mixture stiffens further and starts to resemble glossy shaving foam. Whisk in the white wine vinegar, cornflour and vanilla essence. Line a baking tray with the marked baking paper, putting it pencilled-side down. Spoon the meringue inside the confines of the circle and spread to the edges using a palette knife, making a slight dip in the centre of the meringue so that the outside edge is higher than the centre. Bake the meringue in the oven for an hour, or until the meringue shell has hardened but not coloured. Turn off the oven and leave the meringue inside until the oven temperature has cooled. For the filling, gently heat 100g/3½oz fresh raspberries, all of the redcurrants and two tablespoons of the icing sugar in a small saucepan, until the redcurrants burst and release their juices and the sugar completely dissolves. Do not overcook. Strain the fruit mixture through a fine sieve, reserving the strained juices in a bowl. Set aside to cool completely. When ready to serve, whip the cream and the remaining tablespoon of icing sugar until soft peaks form when the whisk is removed. To serve, spoon the whipped cream into the cooled meringue shell. Arrange the fresh raspberries on top. Drizzle over the raspberry and redcurrant sauce.